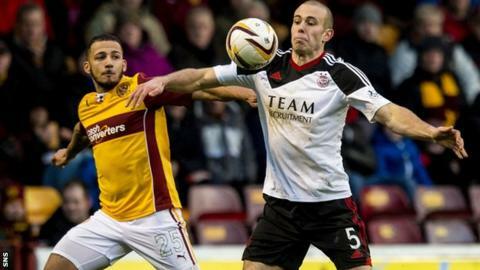 Aberdeen will face Motherwell in a potential second-place decider on the final day of the Scottish Premiership season. The top flight's post-split fixtures have been announced, with St Mirren hosting Partick Thistle in a crucial bottom-six match on 25 April. A final Edinburgh derby of the season will be on 27 April. There will be one round of midweek fixtures after the league splits in two after this weekend. Matches this coming Friday, Saturday and Monday conclude the pre-split programme, with no top-flight action the following weekend due to the Scottish Cup semi-finals. Celtic clinched the league title - their third in a row - last month. Motherwell - currently a point above Aberdeen after beating Inverness on Tuesday - currently occupy the runners-up spot but have played a game more than their closest rivals. And fourth-place Dundee United still harbour ambitions of a top-three finish, with second and third place offering a Europa League qualifying berth. Hearts' expected relegation from the top flight will be confirmed if they lose to Aberdeen on Wednesday evening. With the Tynecastle side detached at the bottom, the major interest in the bottom-six fixtures is the battle to avoid finishing second bottom and entering a relegation play-off with one of the top sides from the Championship. Currently, St Mirren are 11th, two points below Partick Thistle and three adrift of Ross County. Kilmarnock, a point behind Hibernian, have a five-point cushion over the Buddies. Scottish Professional Football League chief executive Neil Doncaster said: "We're delighted to announce today's fixtures, which have a real extra sense of excitement thanks to the Premiership/Championship play-off factor, a new addition starting this season. "We hope fans of all clubs enjoy some thrilling matches in the final five rounds of fixtures."